We already know that you are a serious angler. After all, you are reading our reviews. As a fisherman who takes the sport very seriously, it’s crucial to understand the importance of owning a specialized fishing watch for when you are out on the water. While most of the watches designed for fishing are waterproof, there are some other very important features that your standard watch doesn’t offer. Remember when you were younger and got in trouble for using a cheat sheet on that quiz or test? Well… maybe you saw someone else get in trouble. A great fishing watch is essentially a cheat sheet for anglers. It will reveal critical details that will make catching that next big fish as easy as shooting a fish in a barrel. Many quality watches display details such feeding times and the best time of day to fish. Some brands also include a compass, which is helpful in finding the right fishing spot. The following watches listed below are our favorites. Each of these models can be found online. The Casio AMW700B Forester doesn’t just look rugged- it is rugged. The canvas band is well crafted with a tasteful leather finish and the stainless steel casing is very durable. The materials make the watch waterproof up to 330 feet. Its display shows important details like the moon’s latitude and longitude, and the times of sunset and sunrise. These features are great for estimating where the tide will be. One of the most talked about features of this watch is a built-in fishing timer with vibrating alarms for when you are in the zone. In fact, you can set five different alarms on this watch. One of the more intricate features of this watch is the ability to set a light trigger. An option will trigger the light to automatically come on at a 45-degree angle. This watch is also good for hunting. A respectable watchmaker, Casio gets our stamp of approval for this watch that has all of the features that an angler could want. It’s priced affordably and we consider it to be a great buy. The Casio Sports Gear 100-1V is truly a man’s watch. It may not have the specific features the Pathfinder has, but it sure makes up for it in design and functionality. First, the digital quartz display is stunning with a large clock and calendar. It even shows you the temperature. Around the face of the watch is a very detailed compass that gives you more than just North, East, South and West. The rugged resin band and metal casing are the most durable materials of any of the watches we recommend. And if you get tired of fishing and decide to go deep sea diving, then keep in mind that this watch is waterproof up to 660 feet. Like the Pathfinder, this watch has the ability to set multiple alarms, but the Sports Gear also includes a stopwatch. 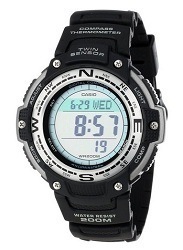 If you are looking for versatility, then the Casio Sports Gear is the best fishing watch for sale. The Timex Expedition might look the nicest, but it offers the fewest features. This is more of a casual fisherman’s watch. Its water-resistant leather band complements the brass casing and black dial well. The built-in nightlight is great for those late night adventures and the watch is water resistant up to 330 feet. The quick date feature will display the day of the month, but it doesn’t offer a full calendar like the other two watches. There is something we like about the look and functionality of each of these watches, but the Casio Pathfinder has the highest impact features for serious anglers. If rugged and sporty is your thing, then go with the Sports Gear. 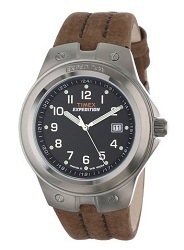 If you are in the market for something that looks nice, then the Expedition has you covered. But please, don’t let your wrist go naked.